This post will focus on the first purpose, that of exploring random matrices. It is meant to be an overview of functions available in the package and not a rigorous treatment of the subject matter. The package provides a number of types for describing random matrices. These types are strictly model parameters that are used to generate random matrices. Supported matrix classes include Wigner matrices, Wishart matrices, and Jacobian matrices. A Wigner matrix is a symmetric matrix with random Gaussian entries. To generate a matrix of this class we can create a model and then call the matrix generator. 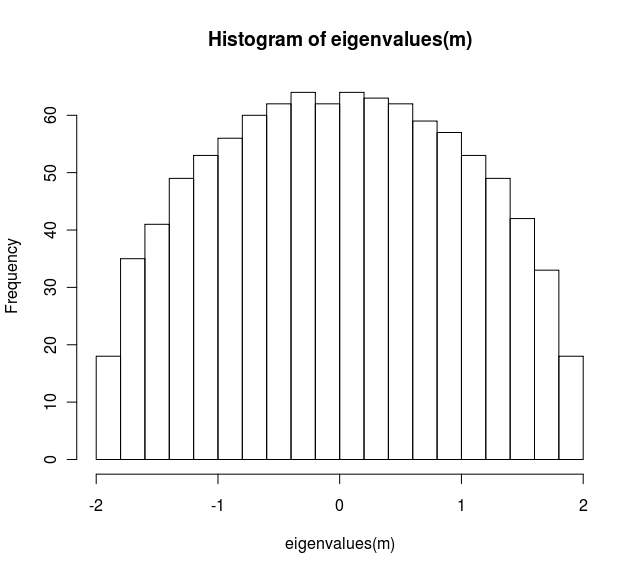 Once we create a matrix we can plot a histogram of the eigenvalues, which conforms to the Wigner semicircle law. Additional arguments can be passed into the model to specify, for example, whether the entries are real or complex. To visually verify that the entries look correct, use the peek function. 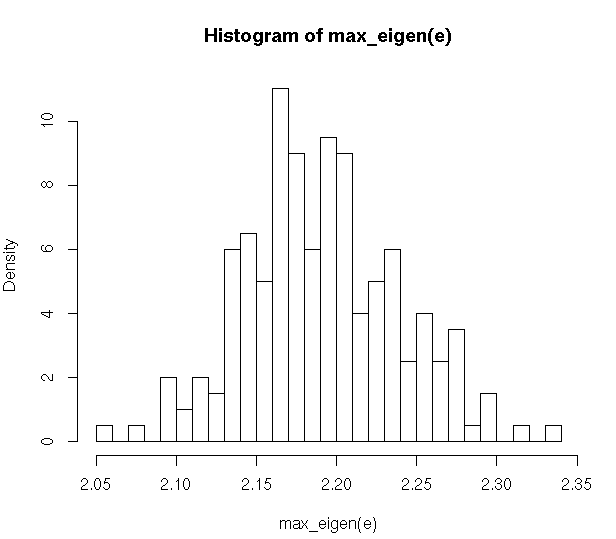 As expected, the histogram for this variant also conforms to the semi-circle law. In finance, a more useful matrix is a Wishart matrix, which is a sample covariance matrix. These matrices have an eigenvalue spectrum that is described by the Marcenko-Pastur distribution. As an example, we’ll create a random Wishart matrix that is similar to two years of daily data on the S&P 500. 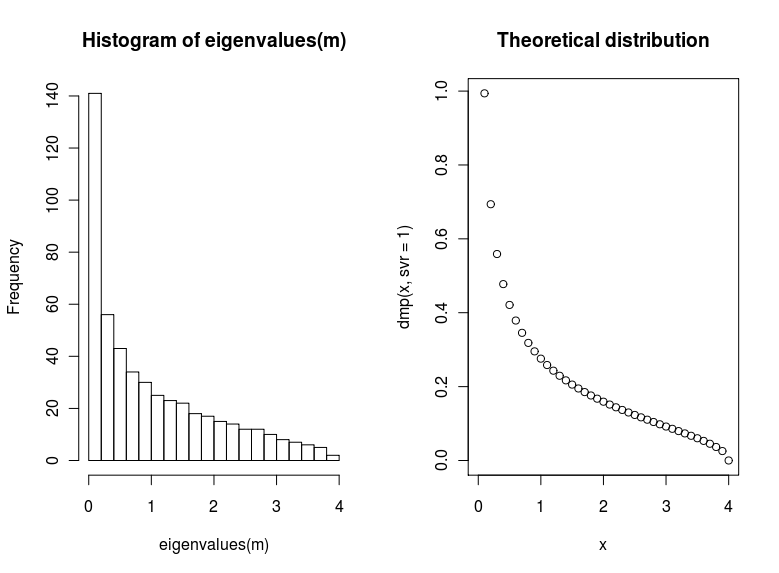 We plot the actual distribution of eigenvalues alongside the theoretical distribution (generated from the RMTstat package). Fitting the spectrum to a theoretical curve enables you to isolate the noise part of the spectrum. Once this is established, it’s possible to clean the source correlation matrix and remove the estimation error. Additional properties of random matrices can be discerned by analyzing ensembles of said matrices. We can generate the ensemble based on an existing model along with a count. Since an ensemble contains many random matrices, there is no practical way of displaying its contents. Hence, only some basic information is printed to reduce screen clutter. This post covered the basic functions of futile.matrix and how one can analyze random matrices and their ensembles using the package. 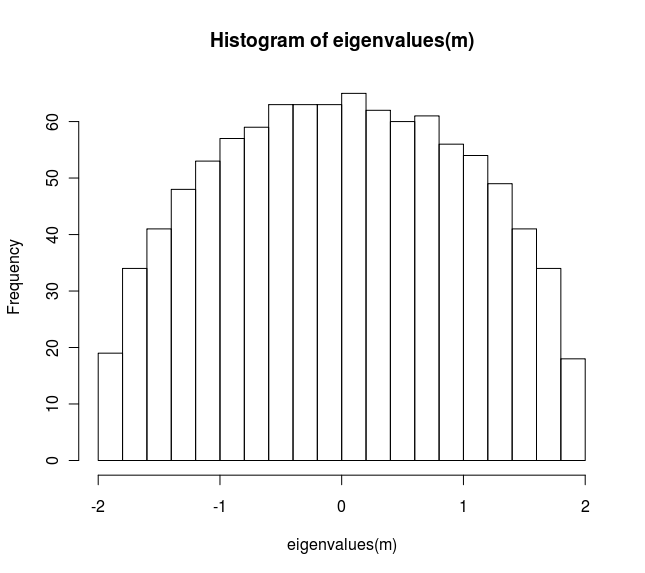 In a subsequent post, we’ll cover using the package to fit distributions and identifying the cutoff point for the noise portion of the eigenvalue spectrum.